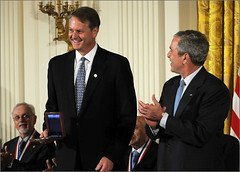 eBay President John Donahoe met US President George W Bush earlier this week at a ceremony at the White House in which eBay was awarded the National Medal of Technology and Innovation. President Bush cited eBay’s pioneering technology which supported online trade and encouraged global entrepreneurship. eBay Ink has a post from two eBay employees who accompanied JD and three eBay sellers to the ceremony. Ooo Lookie! Chimpy and the Chump, might make a good horror movie. The idiot will actually believe that this is of his excellent leadership skills… this new fangled trophy has been handed over to eBay by default, for what it has achieved UP TO NOW, not what it is scheming at the moment. Typical pinhead taking credit for something he never actually did. It would be great to see him on trial for devastating so many people’s lives and business through unfair business practices. I only ask as I have a Law Firm here willing to take on a Class Action Lawsuit for Canadians. Please pass this information along….